The fine art of custom sewing, commemorating the most important days of your life. Welcome to fun adventure in fashion, art and creativity. Yes, some might call it bold and brave… true immersion in the artistic, creative process of the design of a gown from start to finish. In our personalized and intimate process, we also offer our clients a beautiful experience through the fitting process. At our first meeting, I will invite you to my studio where we will have a chance to get to know each other, and you will see where your dress will be created. We can also have this first meeting by phone, email or online video chat. I’ll show you photos of gowns that I have made, and you may even see a gown in progress. We’ll ask and answer all of each other’s initial questions and will hopefully make a perfect bride/dressmaker match. If we are a good match, then we will set up a design consultation. This is a fun and enjoyable process! We go over all of your ideas for your gown and together create a perfect design that you will love. We will take into consideration your likes and dislikes, your body type, fabric choices and more. Some brides have a very specific idea in mind, and others have an idea for the bodice or skirt, but can’t figure out the rest of it. Some brides bring photos of dresses they like, or swatches of fabric or even their own drawings. Some brides are inspired by fantastic gowns they have seen in movies. Some brides love certain fashion eras, from the 1920s to present day. Or they are inspired by fashionable actresses – Grace Kelly, Audrey Hepburn and others. I also have fashion books from many eras to help us, as well as fabric swatches, samples and more. After the design consultation, I will create a visual design for you to review. This may include custom sketches, or sometimes I am able to take your photo and create your design in Photoshop right over your image. This is very effective when it’s hard to imagine how the design might look on you. I will also provide fabric and trimming choices. I prefer to work in natural fibers for custom wedding gowns, such as silk, cotton, wool, even soft, supple leather or suede. We can use chiffon, dupioni, taffeta, charmeuse, satin, lace, beaded fabrics or create our own custom beaded design. I have connections to excellent fabric sources. After your design is finalized, we will take your measurements and start making a toile, or sample, of your gown. This is a test garment to work out the design details and create the perfect fit before cutting the gown out of the real fabric. This process is vital, especially when working with expensive fabrics. If needed, a boned corselet will be built for the gown. This will be fitted to you, and then the toile will be constructed to go on top. If there are handmade details on your gown – silk flowers, ruching, beaded fringe or beadwork, for example – those samples will be created for you to approve. The toile process can take several fittings. Once the toile is perfected and you approve the sample garment and all the details, the real gown will be cut out of the fabric you selected and sewn using fine sewing techniques. All the handmade details will be created. This process can require several more fittings to achieve the perfect fit. The hem length and bustle will be the final step. There are a variety of bustle types, and we will work together to create one that looks perfect with your gown. 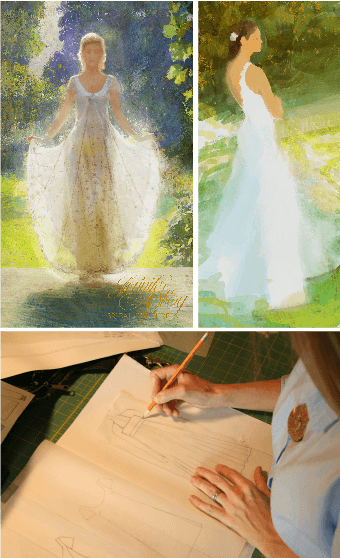 Once your gown has been finalized, a beautiful painting of the dress will be created for you. Maui artist Craig Mullins will create an artistic representation of your special gown. The painting will be printed out on high quality canvas and gallery wrapped.